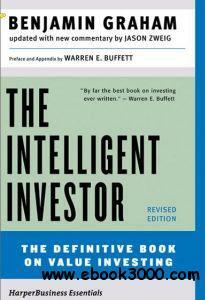 The Intelligent Investor by Benjamin Graham published in 1949, is a widely acclaimed book on investing. Famous investor and billionaire Warren Buffett describes it as "by far the best book on investing ever written", a sentiment echoed by other Graham disciples such as Irving Kahn and Walter Schloss. Robert Bruce Thompson, "Illustrated Guide to Home Chemistry Experiments: All Lab, No Lecture"
With plenty of full-color illustrations and photos, Illustrated Guide to Home Chemistry Experiments offers introductory level sessions suitable for a middle school or first-year high school chemistry laboratory course, and more advanced sessions suitable for students who intend to take the College Board Advanced Placement (AP) Chemistry exam. A student who completes all of the laboratories in this book will have done the equivalent of two full years of high school chemistry lab work or a first-year college general chemistry laboratory course. This hands-on introduction to real chemistry -- using real equipment, real chemicals, and real quantitative experiments -- is ideal for the many thousands of young people and adults who want to experience the magic of chemistry. What is Six Sigma? How is Six Sigma applicable to our organization? What is the Six Sigma process roadmap? What are the benefits of using a Six Sigma process? Gary Gack, a Founder and Managing Partner of Six Sigma Advantage, explains the concepts of Six Sigma, and their application to business processes -- with a focus on software and IT. In interviews, Ken Edwards and Noah Hill of IDX Corporation describe how the software provider to hospitals and group practices is using Six Sigma to optimize development projects. Gack begins the program by defining Six Sigma, and showing how applying its principles drives bottom-line results. He explores the Six Sigma process roadmap, and then explains how the process is adapted for software and IT. Gack shows how organizations can use Six Sigma to evaluate the ‘voice of the customer,’ and balance it with the ‘voice of business.’ Next, he describes how to use Six Sigma for process improvement. Gack concludes with some key considerations for getting started with Six Sigma. This revised version of one of WatchIT’s most requested programs has been updated with new multimedia resources, such as Web links and white papers. ~ Be able to evaluate its applicability to your company’s situation. Why Should CIOs and Software IT Managers Care About Six Sigma? Six Sigma Roadmap: Is the Product or Process Capable? QikProp. Provides rapid ADME predictions of drug candidates. Distributed by Schrodinger. q-ADME. Predicts the following properties: Drug half-life (T1/2); Fraction of oral dose absorbed (FA); Caco-2 permeability; Volume of distribution (VD); Octanol/water distribution coefficient (LogP). q-TOX. Computes toxic effects of chemicals solely from their molecular structure (LD50, MRDD, side effects). VolSurf. Calculate ADME Properties and Create Predictive ADME Models. Distributed by Tripos. Metabolizer Preview. Enumerates all the possible metabolites of a given substrate, predicts the major metabolites and estimates metabolic stability. It can be used for the identification of metabolites by MS mass values, discovery of metabolically sensitive functionalities and toxicity prediction, and provide information related to the environmental effects of chemicals by bacterial degradation. Provided by ChemAxon. ACD/PhysChem Suite. Predicts basic physicochemical properties, like pKa, logP, logD, aqueous solubility and other molecular properties in seconds, usr a fragment-based models. Distributed by ACD/Labs. ACD/ADME Suite. Predicts of ADME properties from chemical structure, like Predict P-gp specificity, oral bioavailability, passive absorption, blood brain barrier permeation, distribution, P450 inhibitors, substrates and inhibitors, maximum recommended daily dose, Abraham-type (Absolv) solvation parameters. Distributed by ACD/Labs. ACD/Tox Suite. Collection of software modules that predict probabilities for basic toxicity endpoints. Several modules including hERG Inhibition, CYP3A4 Inhibition, Genotoxicity, Acute Toxicity, Aquatic Toxicity, Eye/Skin Irritation, Endocrine System Disruption, and Health Effects. Distributed by ACD/Labs. ACD/DMSO Solubility. Predicts solubility in DMSO solution. Distributed by ACD/Labs. Sieve. Program for filtering out molecules with unwanted properties. Open source software distributed by Silicos. ONTOMINE. Fingerprints-based data mining software used for automated Molecular Mining for BioActivity, Toxicity and Side effect prediction. FAF-Drugs2. Free package for in silico ADMET filtering. Distributed by the university of Paris Diderot. ADMET Predictor. Software for advanced predictive modeling of ADMET properties. Distributed by Simulations plus, Inc.
ClassPharmer. ClassPharmer is a cheminformatics platform for lead identification and prioritization, de novo design, scaffold hopping and lead optimization. The software is divided into four modules – Basic, SAR, Design and ADMET – each of which can be licensed separately. Distributed plu Simulation Plus, Inc.
GastroPlus. Simulates the oral absorption, pharmacokinetics, and pharmacodynamics for drugs in human and preclinical species. The underlying model is the Advanced Compartmental Absorption and Transit (ACAT) model. Distributed plu Simulation Plus, Inc. Discovery Studio TOPKAT Software. Cross-validated models for the assessments of chemical toxicity from chemical's molecular structure. Distributed by Accelrys. Discovery Studio ADMET Software. The ADMET Collection provides components that calculate predicted absorption, distribution, metabolism, excretion, and toxicity (ADMET) properties for collections of molecules. Distributed by Accelrys. PreADME. Calculates molecular descriptors. Predicts Drug-likeness. ADME predictions. Molcode Toolbox. Molcode Toolbox allows prediction of medicinal and toxicological endpoints for a large variety of chemical structures, using proprietary QSAR models. KOWWIN - EPI Suite. Estimates the log octanol-water partition coefficient of chemicals using an atom/fragment contribution method. Distributed by the EPA~s Office of Pollution Prevention Toxics and Syracuse Research Corporation (SRC) as part of the EPI Suite. For Windows. ChemTree. Predicts ADME/Tox properties using QSAR. Distributed by Golden Helix. OncoLogic. Evaluates the likelihood that a chemical may cause cancer, using SAR analysis, experts decision mimicking and knowledge of how chemicals cause cancer in animals and humans. Distributed for free by the US Environmental Protection Agency (EPA). HazardExpert Pro. Predicts the toxicity of organic compounds based on toxic fragments. Distributed by CompuDrug. MetabolExpert. Predicts the most common metabolic pathways in animals, plants or through photodegradation. Distributed by CompuDrug. MEXAlert. Identifies compounds that have a high probability of being eliminated from the body in a first pass through the liver and kidney. Distributed by CompuDrug. PrologP/PrologD. Predicts the logP/logD values using a combination of linear and neural network methods. Distributed by CompuDrug. Leadscope. Estimates toxiticy using QSAR. Distributed by Leadscope. COMPACT. Identifies potential carcinogenicity or toxicities mediated by CYP450s. CASETOX. Uses MCASE to predict toxicity. Distributed by MultiCASE. META. Predicts metabolic paths of molecules. Distributed by MultiCASE. PK-Sim. Predicts ADMET properties. Distributed by Bayer technology Services. SimCYP. The SimCYP Population-based ADME Simulator is a platform for the prediction of drug-drug interactions and pharmacokinetic outcomes in clinical populations. Distributed by SimCYP. Cloe Predict. Pharmacokinetic prediction using phisiologically based pharmacokinetic modeling (PBPK), and prediction of human intestinal absorption using solubility, pKa and Caco-2 permeability data. Distributed by Cyprotex Discovery. KnowItAll - ADME | Tox Edition. Prediction of ADME Tox properties using consensus modeling. Distributed by Bio-Rad Laboratories. PASS. Identification of probable targets and mechanisms of toxicity. MetaDrug. Predicts toxicity and metabolism of compounds using >70 QSAR models for ADME/Tox properties. Distributed by GeneGo. ADMEWORKS ModelBuilder. Builds QSAR/QSPR models that can later be used for predicting various chemical and biological properties of compounds. Models are based on values of physicochemical, topological, geometrical, and electronic properties derived from the molecular structure, and can be imported into ADMEWORKS Predictor. ADMEWORKS Predictor. Virtual (in silico) screening system intended for simultaneous evaluation of the ADMET properties of compounds. It complements existing in silico technologies for evaluating pharmacological properties. MetaSite. Computational procedure that predicts metabolic transformations related to cytochrome-mediated reactions in phase I metabolism. The method predicts "hot spots" in the molecule, suggests the regions that contribute most towards each "hot spot", providing additional derivation sites for chemists to design new stable compounds, predicts the structures of the most likely metabolites and warns about the potential of CYP mechanism-based inhibition. Distributed by Moldiscovery. OSIRIS Property Explorer. Integral part of Actelion's inhouse substance registration system. Calculates on-the-fly various drug-relevant properties for drawn chemical structures, including some toxicity and druglikeness properties. Maintained by the Virtual Computational Chemistry Laboratory. ToxPredict. Web service to estimate toxicological hazard of a chemical structure. Molecules can be drawn, or input by any identifier (CAS, Name, EINECS) or SMILES or InChI or URL of OpenTox compound or dataset. Provided by OpenTox. ToxCreate. Web service to create computational models to predict toxicity. Provided by OpenTox. ADME-Tox. ADME-Tox (poor absorption, distribution, metabolism, elimination (ADME) or toxicity) filtering for small compounds, based on a set of elementary rules. STITCH. Resource to explore known and predicted interactions of chemicals and proteins. Chemicals are linked to other chemicals and proteins by evidence derived from experiments, databases and the literature. STITCH contains interactions for over 74,000 small molecules and over 2.5 million proteins in 630 organisms. XScore-LogP. Calculates the octanol/water partition coefficient for a drug, based on a feature of the X-Score program. VirtualToxLab. 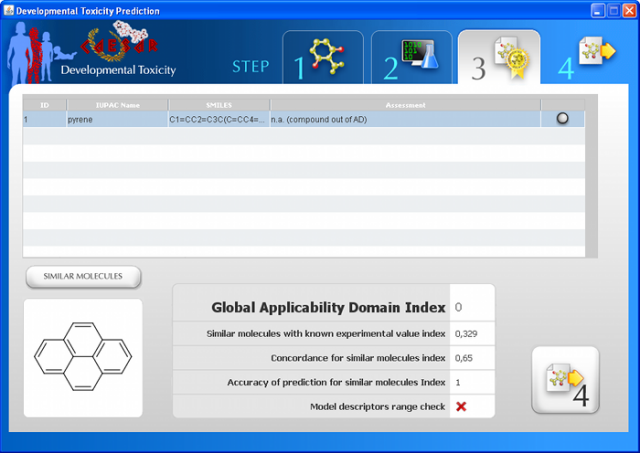 ''In silico'' tool for predicting the toxic (endocrine-disrupting) potential of existing and hypothetical compounds (drugs, chemicals, natural products) by simulating and quantifying their interactions towards a series of proteins known to trigger adverse effects using automated, flexible docking combined with multi-dimensional QSAR (mQSAR). PharmMapper. Freely accessed web-server designed to identify potential target candidates for the given probe small molecules (drugs, natural products, or other newly discovered compounds with binding targets unidentified) using pharmacophore mapping approach. MODEL - Molecular Descriptor Lab. Computes structural and physichemical properties of molecules from their 3D structures. PreADMET. Web-based application for predicting ADME data and building drug-like library using in silico method. Free ADME Tools. ADME Prediction Toolbox of the SimCYP application provided free of charge by SimCYP. UM-BBD Pathway Prediction System. The PPS predicts plausible pathways for microbial degradation of chemical compounds. Predictions use biotransformation rules, based on reactions found in the UM-BBD database or in the scientific literature. Provided by the University of Minnesota. MetaPrint2D. Metabolic site predictor. MetaPrint2D is a tool that predicts xenobiotic metabolism through data-mining and statistical analysis of known metabolic transformations reported in scientific literature. MetaPrint2D-React can make predictions concerning a wider range of reactions than MetaPrint2D, and is able to predict the types of transformation that can take place at each site of metabolism, and the likely metabolite formed. Provided by the University of Cambridge. MetaPrint2D-React.. Metabolic site predictor. MetaPrint2D is a tool that predicts xenobiotic metabolism through data-mining and statistical analysis of known metabolic transformations reported in scientific literature. MetaPrint2D, which predicts sites of phase I metabolism, defined as the addition of oxygen (e.g. hydroxylation, oxidation, epoxidation) or elimination reactions. Provided by the University of Cambridge. PK/DB. Freely available database for pharmacokinetic properties, designed with the aim of creating robust databases for pharmacokinetic studies and in silico ADME (Absorption, Distribution, Metabolism, and Excretion) prediction. Leadscope Toxicity Database. Database of 160,000 chemical structures with toxicity data. Distributed by Leadscope. The ADME databases. Databases for benchmarking the results of experiments, validating the accuracy of existing ADME predictive models, and building new predictive models. The ADME database. Provides comprehensive data for structurally diverse compounds associated with known ADME properties, including human oral bioavailability, enzymes metabolism, inhibition and induction, transport, plasma protein binding and bloodbrain barrier. Distributed by Aureus. SuperTarget Database. Database of about 7300 drug-target relations. SIDER. (Side Effect Resource). contains information on marketed medicines and their recorded adverse drug reactions. The information is extracted from public documents and package inserts. The available information include side effect frequency, drug and side effect classifications as well as links to further information, for example drug–target relations. ADME DB. Database containing data on interactions of substances with Drug Metabolizing Enzymes and Drug Transporters. It is designed for use in drug research and development, including drug-drug interactions and ADME (Absorption, Distribution, Metabolism and Excretion) studies. SAR Genetox Database. Genetic toxicity database to be used as a resource for developing predictive modeling training sets. Distributed by Leadscope. SAR Carcinogenicity Database. Carcinogenicity database with validated structures to be used as a resource for preparing training sets. Distributed by Leadscope. The new version of the CAESAR models, that will be made freely available soon, will include some new features, helpful both to improve usability of the software and to obtain more reliable predictions. * The molecule editor included is part of the ChemAxon Marvin package. The image on the right, as well as all the images used as preview in this page, refers to the stand-alone version of CAESAR software, which anticipate most of the new features of CAESAR 2.0. According to REACH, user should check if "the substance is included in the applicability domain of the model", for a correct use of the (quantitative) structure-activity relationship (Q)SAR model. Thus, the CAESAR's tool is based not only on the chemical information, as the typical AD tools, but also on toxicity results. Furthermore, it uses not only a priori data (from the chemical structure), but also a posteriori ones, from the results of the models. This tool proved to discriminate cases where QSAR can be applied, and cases were there may be problems. WARNING: the MUTAGENICITY model could classify a compound as mutagen even if it is formally out of the applicability domain. This behaviour is normal for this model and it is related to the use of structural alerts [ref.]. Apart from this new feature, the user could still compare the prediction obtained for a molecule with those obtained for its six most similar molecules founded in the dataset used to build the model, as in the current version of CAESAR models. The stand-alone version of CAESAR can be downloaded for free and have been developed to work off-line. The CAS number input method is not available for this version of the software. If you need help using the software, you can use the video tutorials we have prepared, that will guide you step-by-step explaining exactly how to use the CAESAR stand-alone software. Download the stand-alone version of the CAESAR v2.0 QSAR model. This version could be run locally with no internet connection needs. Stand-alone version of the other CAESAR models will be available in the next future. Problem importing structures using "import structure(s) from file". Needs JAVA™ 1.5 or higher to run. Click here to download. The stand-alone version works on 32bit systems only. If you need any information and/or support, please contact: coord@caesar-project.eu. All the models implemented have been developed by the CAESAR consortium. Toxtree was developed by Ideaconsult Ltd (Sofia, Bulgaria) under the terms of a JRC contract. 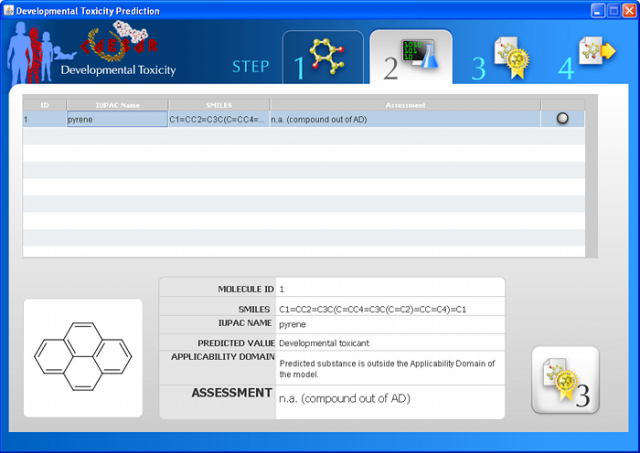 The software is made freely available as a service to scientific researchers and anyone with an interest in the application of computer-based estimation methods in the assessment of chemical toxicity. Toxtree 2.5.0 is a standalone software application that can be run on the Microsoft Windows operating system as well as other platforms with the Java 2 Runtime Environment (Standard Edition 1.5 or newer) installed. Visit the Sourceforge Toxtree download page. The Toxtree software can be downloaded (free of charge) from this website. Toxtree 1.60 is a standalone software application that can be run on the Microsoft Windows operating system as well as other platforms with the Java Runtime Environment (Standard Edition 1.5 or newer) installed. The setup ("exe") file contains all the required packages for Windows, including the Java(TM) Runtime Environment (JRE 5.0). The archive ("zip") file is an archive of the program without the Windows installer; this can be used to run the program also on a Unix/Linux platform. In addition to the rulebases already implemented in Toxtree 1.60, the following plug-in was developed by the Istituto Superiore di Sanita' (Rome, Italy) to provide a means of identifying organic functional groups. The ISSFUNC rulebase is a functional groups profiler that implements a set of 204 organic functional groups recognised by the "Checkmol" program, developed by Norbert Haider (University of Vienna, Austria). The jar file should be placed in the "Toxtree\ext\" directory of the Toxtree installation. Please report any comments, enquiries or bug reports via the dedicated Sourceforge webpage. Easy to follow manual provided. End-user modifications of the tree possible (by adding new structural rules). 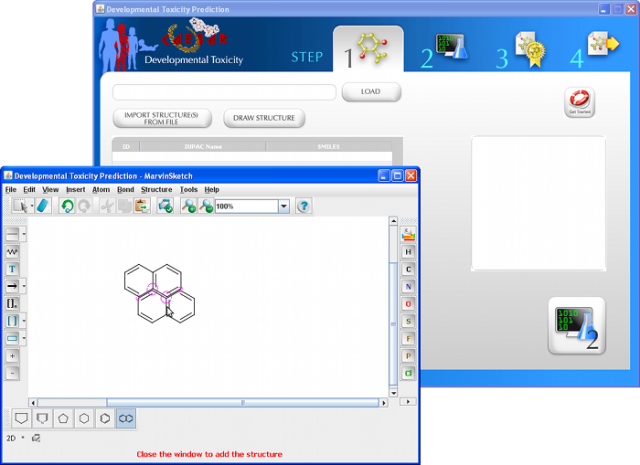 Classification of chemical structures by an interactive 2D graphical editor. Batch mode classification possible; CSV, TXT or SDF file formats supported. Results (with classification path explained) viewable in a graphical user interface or saved (file formats supported: CSV, SDF or TXT). Implementation of Cramer decision tree approach to estimate toxic hazard. Implementation of Verhaar scheme for modes of toxic action. Implementation of BfR and SICRET rules to predict skin irritation and corrosion. Implementation of BfR rules to predict eye irritation and corrosion. Implementation of Benigni-Bossa rules to predict mutagenicity and carcinogenicity. Toxtree is open source software; you are authorised to redistribute it and/or modify it under the terms of the GNU General Public License as published by the Free Software Foundation; either version 2 (June 1991) of the License, or any later version. For more details, see the GNU General Public License at http://www.gnu.org/licenses/gpl.txt. Developed by Dr Nina Jeliazkova (Ideaconsult Ltd; contact nina@acad.bg) on behalf of the Joint Research Centre (JRC). Copyright European Union (2005, 2007 & 2008). The Toxtree software is made available by the JRC as a service to the worldwide scientific and regulatory communities. The JRC and European Communities provide no technical support, warranties or remedies for this software. It does not imply any endorsement or acceptance by the JRC or by the European Commission of the algorithms encoded in the software. The European Commission shall not be liable to the User or any third party for any direct or indirect, special, incidental, punitive, cover or consequential damages, arising out of the use of, or inability to use, Toxtree. Benigni R, Bossa C, Jeliazkova N, Netzeva T & Worth A (2008). The Benigni / Bossa rulebase for mutagenicity and carcinogenicity - a module of Toxtree. European Commission report EUR 23241 EN. Cramer GM, Ford RA & Hall RL (1978) Estimation of Toxic Hazard - A Decision Tree Approach. Food and Cosmetics Toxicology 16, 255-276. Gerner I, Liebsch M & Spielmann H (2005). Assessment of the eye irritating properties of chemicals by applying alternatives to the Draize rabbit eye test: the use of QSARs and in vitro tests for the classification of eye irritation. ATLA 33, 215-237. Verhaar HJM, van Leeuwen CJ & Hermens JLM (1992). Classifying environmental pollutants. 1. Structure-activity relationships for prediction of aquatic toxicity. Chemosphere 25, 471-491. Verhaar HJM, Mulder W & Hermens JLM (1995). QSARs for ecotoxicity. In: Overview of structure-activity relationships for environmental endpoints, Part 1: General outline and procedure. Hermens JLM (Ed), Report prepared within the framework of the project "QSAR for Prediction of Fate and Effects of Chemicals in the Environment", an international project of the Environment; Technologies RTD Programme (DGXII/D-1) of the European Commission under contract number EV5V-CT92-0211. Verhaar HJM, Solbe J, Speksnijder J, van Leeuwen CJ & Hermens JLM (2000). Classifying environmental pollutants: Part 3. External validation of the classification system. Chemosphere 40, 875-883. Walker JD, Gerner I, Hulzebos E & Schlegel K (2005). The Skin Irritation Corrosion Rules Estimation Tool (SICRET). QSAR Comb. Sci. 24, 378-384.
where x1 and x2 are the independent descriptor variables and a, b, and c are fitted parameters. Examples of molecular descriptors include the molecular weight and the octanol-water partition coefficient. Additional examples are provided in our Molecular Descriptors Guide (PDF) (47 pp, 279 KB). QSAR toxicity predictions may be used to screen untested compounds in order to establish priorities for traditional bioassays, which are expensive and time-consuming. QSAR models are useful for estimating toxicities needed for green process design algorithms such as the Waste Reduction Algorithm. Hierarchical method - The toxicity for a given query compound is estimated using the weighted average of the predictions from several different models. The different models are obtained by using Ward’s method to divide the training set into a series of structurally similar clusters. A genetic algorithm-based technique is used to generate models for each cluster. The models are generated prior to runtime. FDA method - The prediction for each test chemical is made using a new model that is fit to the chemicals that are most similar to the test compound. Each model is generated at runtime. Single-model method - Predictions are made using a multilinear regression model that is fit to the training set (using molecular descriptors as independent variables) using a genetic algorithm-based approach. The regression model is generated prior to runtime. Group contribution method - Predictions are made using a multilinear regression model that is fit to the training set (using molecular fragment counts as independent variables). The regression model is generated prior to runtime. Nearest neighbor method - The predicted toxicity is estimated by taking an average of the three chemicals in the training set that are most similar to the test chemical. Consensus method - The predicted toxicity is estimated by taking an average of the predicted toxicities from each of the above QSAR methodologies. Random forest method- The predicted toxicity is estimated using a decision tree which bins a chemical into a certain toxicity score (i.e. positive or negative developmental toxicity) using a set of molecular descriptors as decision variables. The random forest method is currently only available for the developmental toxicity endpoint. The random forest model for the developmental toxicity endpoint was developed by researchers at Mario Negri Institute for Pharmacological Research as part of the CAESAR project. These methodologies are explained in detail in the publications below. T.E.S.T. will enable users to easily estimate acute toxicity using the above QSAR methodologies. The software is now available for download. The software is described in further detail in the User's Guide (PDF) (66 pp, 540 KB).The software is based on the Chemistry Development Kit , an open-source Java library for computational chemistry. Bioconcentration Factor (BCF). The bioconcentration factor data set was compiled by researchers at the Mario Negri Isituto Di Ricerche Farmacologiche. Models for additional endpoints will be added as they are completed. Get email alerts when new versions of the T.E.S.T. software are posted. 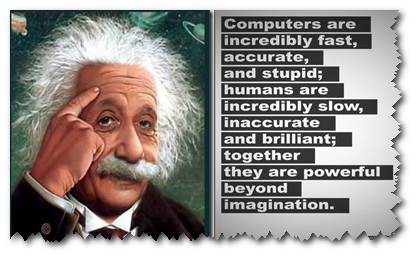 The training and prediction sets used in the software are available here. Sample structure data files (such as a MDL SD file) are available here. Each toxicity data set is now split into a training and test set. For Windows XP®, 1 GB of RAM is recommended. For Windows Vista®, 2 GB of RAM is recommended. Save the appropriate installation file to your hard drive. Due to the large size of the file, the download may take 15 minutes or longer depending on the speed of the connection. Double-click the installation file (for Linux users: open a shell, cd to the directory where you downloaded the installer and at the prompt type: sh ./install.bin). Sushko, I.; Novotarskyi1, S.; Körner, R.; Pandey, A. K.; Cherkasov, A.; Li, J.; Gramatica, P.; Hansen, K.; Schroeter, T.; Müller, K.-R.; Xi, L.; Liu, H; Yao, X.; Öberg, T.; Hormozdiari, F.; Dao, F.; Sahinalp, C.; Todeschini, R.; Polishchuk, P.; Artemenko, A.; Kuz’min, V.; Martin, T.M. ; Young, D. M.; Fourches, D.; Muratov, E.; Tropsha, A.; Baskin, I.; Horvath, D.; Marcou, G.; Varnek, A; Prokopenko, V. V.; Tetko, I.V. (2010). “Applicability domains for classification problems: benchmarking of distance to models for AMES mutagenicity set.” J. Chem. Inf. Model, 50, 2094-2111. Cassano, A.; Manganaro, A; Martin, T.; Young, D.; Piclin, N.; Pintore, M.; Bigoni, D.; Benfenati, E. (2010). “The CAESAR models for developmental toxicity.” Chemistry Central Journal, 4(Suppl 1):S4. Zhu, H.; Martin, T.M. ; Young, D. M.; Tropsha, A. (2009). “Combinatorial QSAR Modeling of Rat Acute Toxicity by Oral Exposure.“ Chemical Research in Toxicology, 22 (12), pp 1913-1921. Benfenati, E., Benigni, R., Demarini, D.M., Helma, C., Kirkland, D., Martin, T.M., Mazzatorta, G., Ouedraogo-Arras, G., Richard, A.M., Schilter, B., Schoonen, W.G.E.J., Snyder, R.D., and C. Yang. (2009). “Predictive Models for Carcinogenicity and Mutagenicity: Frameworks, State-of-the-Art, and Perspectives.” Journal of Environmental Science and Health Part C, 27, 2: 57-90. Young, D.M. ; Martin, T.M. ; Venkatapathy, R.; Harten, P. (2008) “Are the Chemical Structures in your QSAR Correct?” QSAR & Combinatorial Science, 27 (11-12), 1337-1345. Martin,T.M., P. Harten, R. Venkatapathy, S. Das and D.M. Young. (2008). “A Hierarchical Clustering Methodology for the Estimation of Toxicity.” Toxicology Mechanisms and Methods, 18, 2: 251–266. Martin, T.M., and D.M. Young. (2001). “Prediction of the Acute Toxicity (96-h LC50) of Organic Compounds in the Fathead Minnow (Pimephales Promelas) Using a Group Contribution Method.” Chemical Research in Toxicology, 14, 10: 1378–1385. We Miss You"GENIUS OF THE CENTURY&A DESIGNER AT HEART"
Jeffrey S. Young, William L. Simon, "iCon Steve Jobs: The Greatest Second Act in the History of Business"